The experience of anxiety is a common one, encountered by us all at various moments of life. For some women; however, the sense of anxiety is so overwhelming and consuming that it can actually be diagnosed as a specific disorder. There are a range of recognized types of anxiety disorder, each pertaining to different triggers and everyday factors which can cause stress and worry in some people. Read on to find out more about four of the most commonly diagnosed anxiety types. Those who have severe OCD can find that the condition effects their relationships, work, and social functioning, because they are constantly preoccupied with other concerns. Some amount of nervousness concerning new people or large groups is natural; however, for those who experience social anxiety, this emotion can be so extreme that it causes a sense of dread and fear. In severe cases, social anxiety can actually stop sufferers from leaving the house - therefore interfering with their schooling, work, relationships, and worsening their ability to function in society. It can be a very difficult condition to live with, especially due to the fact that the very nature of it might mean you avoid visiting a doctor to discuss your symptoms. After experiencing events such as these, it is possible for detailed memories to present themselves (flashbacks) at any time. This may then lead to renewed stress and anxiety which can be difficult to alleviate. 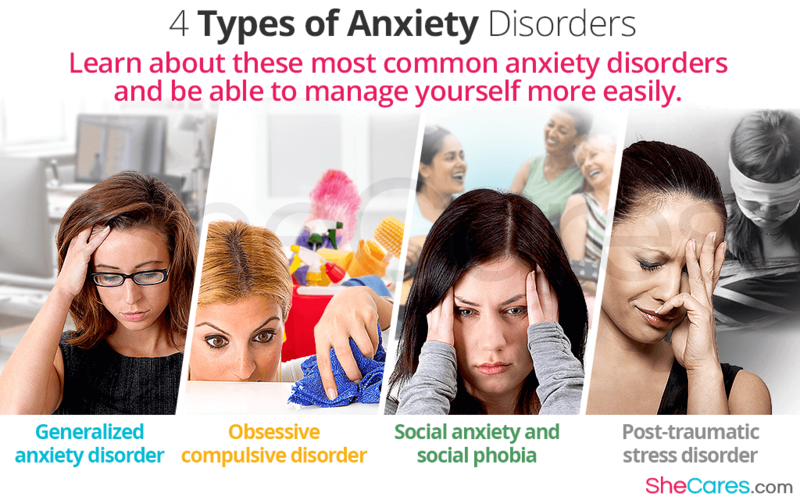 These are just four of the most common types of anxiety disorders, but there are several others which can affect people. Learning about the different kinds can be useful in order to recognize them either in yourself or in a loved one, and enhancing your understanding about them should enable you to manage anxiety more easily.